What Gutter Specials Do We Have? American Gutter Inc. specializes in cleaning or installing new seamless gutter. 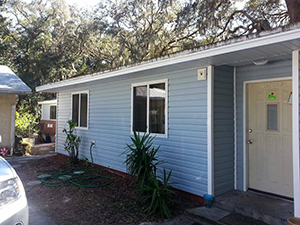 We serve Gainesville, Jacksonville, and every other city or county within North Florida. American Gutter Inc. offers the best gutter solutions to homeowners. We use special gutter guard products so that your gutters do not get clogged up with leaves, and debris. It is recommended that you get your gutters cleaned as much as possible to protect your home. Let American Gutter Inc make sure you have the right gutter guard and gutter protection for your home. American Gutter Inc. is founded by Keith Chapman, and has been in business since 1997. 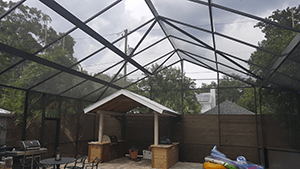 Aside from seamless gutter cleaning and installation, we also provide services like constructing screen rooms, glass rooms, pool enclosures, sheds and more. 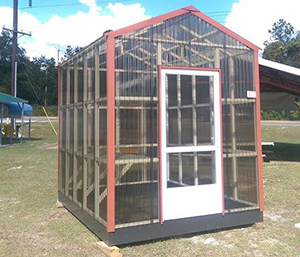 We are partners with several well experienced and skilled aluminum technicians within the North Florida region which allows our company to perform jobs of all sizes. One thing we take pride in is that there is no gutter job that is too big for us to handle. 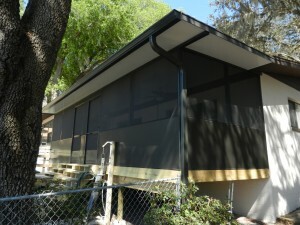 Installing gutters in our specialty, but we also specialize in designing and building screen rooms. We can create glass rooms and pool enclosures in nearly any size or configuration. American Gutter Inc. is proud to announce that we now offer financing for all of our Home Improvement Projects. Plans for nearly all credit types and amounts from $1,000.00 to $100,000.00. Click on the link below for fast approval. 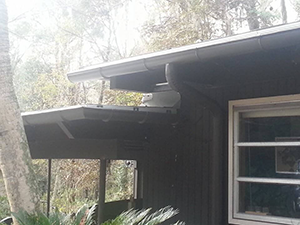 American Gutter Inc. is a specialist in Seamless gutter. We do residential and commercial Gutters. We take pride in being able to provide superior gutter products at competitive rates. You will receive quality service and professional craftsmanship and we provide unbeatable estimations. We have Superior Sheds. 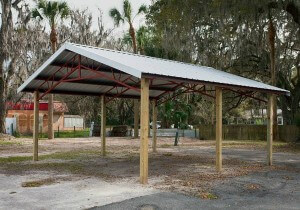 Our Sheds have a 180 mph wind rating 3/4″ tongue and groove floor and more. 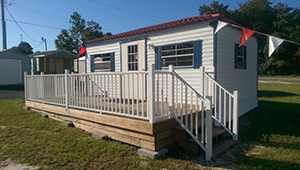 From our Bungalow all Aluminum exterior to our Country Inn with multiple exterior options we have you storage shed needs covered. 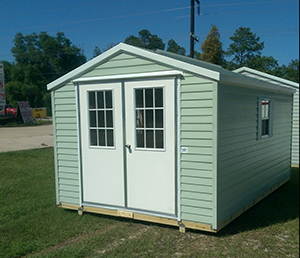 Combining form, function and appearance we can be sure to have a shed to fit your needs. Look for more information on them in our Shed Division section in the Services Menu. At American Gutter Inc. you will find that we have a number of services to beautify and protect your home. 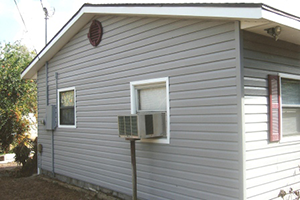 An addition service we offer is Siding. From standard Lap all the way up to the high end Log Siding. 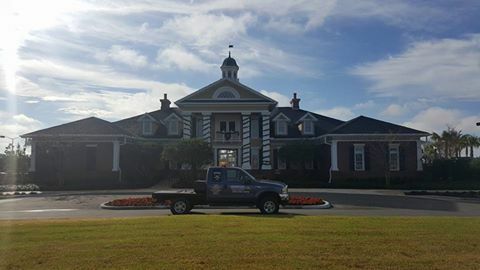 We offer high grade vinyl products that will last through the seasons. 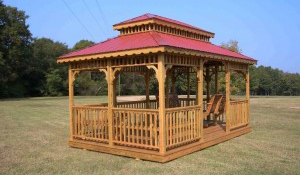 Enjoy your yard more often with a shady Pergola or covered Gazebo. 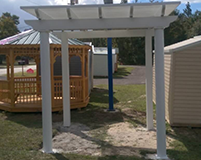 Our Pergolas are fully custom and completely low maintenance aluminum. 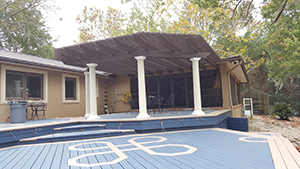 Fully embossed with driftwwod grain and an assortment of color option these Pergolas will last for many years to come.Our Gazebos are fully Handcrafted and Amish built with options ranging from screening to double roofs these elegant buildings will add beauty and function to your yard. Check them out in the New Shed Division link in the Services Menu. 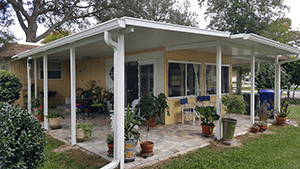 Screen Rooms And Patio Covers Check the link in our Services Menu and you can learn more about our custom Screen Rooms and Patio Covers. Virtually unlimited in our design abilities, if you can dream it we can probably design and engineer it. We have designed some beautiful screen rooms around N Florida. Check out our Outdoor Spaces link and see more of what we can do for you. American Gutter is very proud of our patio division. The estimates are free. We fully design, engineer and build screen rooms, patio covers, pool enclosures, carports and glass rooms. We build on existing slabs, decks, or knee walls, or can construct the same. 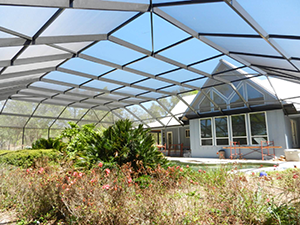 We also build “Nature Scape”, fully insulated glass rooms w/ insulated roof and walls. That isn’t’ the end of the services we offer. we also offer services such as Railings, Doors, Windows Skirting, Soffit and Fascia. Do you have a deck or balcony that needs a Railing? we have all aluminum Railings in m,multiple styles to fit your lifestyle. Replacement Doors and Windows for your existing Screen Room or Glass Room. 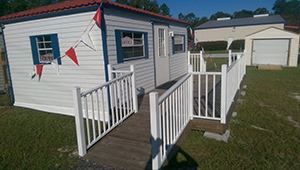 Skirting to close that gap around your Shed or Mobile Home. We can repair and replace your Soffit and Fascia as well as wrap it in aluminum.